Picture from the Past !!! 8th June, 1974 as photographed by Bob Francis. Clearly the locomotive had not been on the plinth wor a long time then ... Original photo on Photopic.net. Note the unusual plinth - looks like a locomotive turntable! This 16B class Pacific 805 was built by the North British Locomotive Company in 1917. She was later re-boilered and became a 16BR but, following withdrawal in June, 1972, she was re-fitted with an original style Belpaire firebox and became a 16B again. 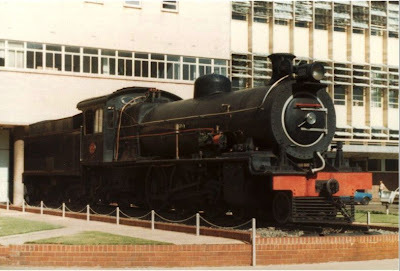 She was plinthed at Johannesburg Station on the 8th June, 1974, when photographed by Bob Francis. 1980 photo by Dave Coxon - his webpage is here. A former South African minister of Transport (1954-74) - Ben Schoeman - worked as a fireman on this engine from 1931-33. This late 1980's image is courtesy of Phil Braithwaite. Fortunately this engine #805 was saved by moving her to the OUTENIQUA TRANSPORT MUSEUM in George where she is on display in splendid condition - you may see its 2007 picture here. That was my Grand father's (Bannink) loco, he was machinist and min Schoeman was his stoker.